After my first premium template Genta, today I’m releasing a new one. 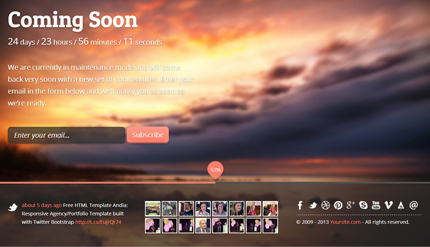 It’s called Eli and is a responsive coming soon page built with Twitter Bootstrap. Just like Genta, Eli is a perfect template for creating an under construction page for an upcoming site or product and begin collecting subscribers before the launch. 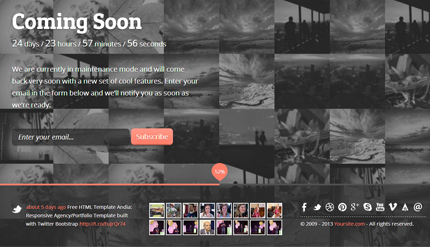 It comes with 2 different background types: fullscreen images slideshow and fullscreen rotating portfolio. Also it offers some other nice features as you can see below. Eli is for sale now on WrapBootstrap for $6.